1-Let us begin with latest security situation in Syria. Can you please update our readers with some background information of the situation and how it all happened? It’s really a very important question for anyone who likes to know the truth about this crisis which has prevailed on this country, which is dear to all Arabs and Muslims. I wish I could be brief as much as possible, because there are many important things to be said in order to have a clear picture. We need to put the developments in their broader context, the new American policy after the fall of the Soviet Union, and the adoption of the theory of filling the vacuum. Ever since the 2003 invasion of Iraq, the Bush administration has said that one of its key reasons for overthrowing Saddam Hussein was that an Iraq with a freely chosen, representative government could serve as a model for spreading democracy in the Middle East. That’s how we can understand the rush to adopt the movements that took place in some Arabic countries in early 2011,and pushing forward their plans to overthrow national governments by igniting popular uprisings in the name of supporting the popular legitimate demands of democracy, providing them with all means, including arms which turned many of those interventions into armed conflicts between the national governments and the western backed terrorists called as “revolutionists”, or“jihadists”using the name of religion to manipulate with hearts and minds of the majority of the public opinion in the Arab and Islamic world. In Syria, like few other Arab countries, domestic protests took place early in 2011, the government has reacted directly to meet the demands judged right,it abolished the emergency law and the state security court, the government passed a law regulating the right to peaceful demonstration. However, the crisis was designed to ignore any positive effort, that’s why riots, killing of innocents on both sides, terrorizing the population, and sabotaging both public and private property have continued.President Assad confirmed that any country has errors and mistakes, but the urgent need to correct them does not justify the spreading of chaos, the breaking of laws, and harming of public interests. That’s how it was clear that Syria was facing a well-planned scenario to overthrow the state and to replace it with another, using the pretext of human rights and democracy. That was already confirmed two years later by the former French Minister of Foreign affairs, Roland Dumas when he told a French television station that “Great Britain used to train and support Syrian rebels at least two years prior to the revolt aiming to overthrow president Assad from power|”. However, Syrian national army, backed by allies and friends, has pursued with pride the war against the terror of the western backed criminal groups, achieving victory after victory, liberating the areas which were controlled by those groups, and achieved lately a the liberation of the eastern suburb of Damascus, and succeededto eliminate the terrorists who were daily bombarding the capital, killing and injuring thousands of innocent civilians. 2- Can tell us some details of role of the external forces in the present situation? In fact, and as we have seen, the problem in Syria was not between the Syrians, but it was designed to look like that.Soon after the eruption of demonstrations, Syria has noticed that the real target was to down the state with all tools. Thereafter Syria faced an unprecedented hostile campaign of regional and international mobilization under the banner of supporting the Syrian people against “dictatorial regime”.All methods of pressure on Syria were used, including imposing illegal unilateral political and economic sanctionsoutside the United Nations, and trying to impose political and diplomatic isolation by suspending Syria’s membership in the international and regional organizations. Armed groups were formed againstthe state and provided with arms and funds, as well as all forms of logistical support, including training and intelligence. The conflict in Syria has been described by the west directly as a civil war between conflicting sects Sunni and Shia; therefore tens of thousands of foreign fighters have been recruited from more than 100 nationalities, and facilitated their move to Syria mainly from Turkeyto fight againsttheSyrian government. Thus, the United States and its allies sought to seize all the strings to oblige the Syrian government to surrender; including the exercise of different politicalpressures and economic blackmail against any country that could supportSyria. Every time the Syrian army achieves victory on the ground, some western countriesraise their voicesand intensify their movements in an attempt to change the track of events, by creating fakescenes of alleged use of toxic chemicals by Syrian army, to justify their aggression as happen recently by the triparty aggression led by the US, UK and France against Syria under these accusations based on staged footage without any serious investigation. However, they did not succeed, and they will never, becauseof the valiant resistance of the Syrian Arab Army supported by its loyal allies, who have changedsignificantly the balance of power and rules of engagement in favor of Syria. 3-Please share with us your views about role of OIC and the Arab League Vis a Vis Syrian situation? Unfortunately, these two organizations were not able to play any positive role in the Syrian crisis because of the control of some members of the anti-Syrian coalition, which made these two organizations additional tools in the anti-Syrian front. Syria’s membership in these two organizations has been frozen under the influence of Qatar and Saudi Arabia, and in a total contradiction with the charters of both organizations, which impose the unanimity in adopting any resolution, while many countries have informed us of their opposition to these decisions. 4-Would you like to please share some details about the Golan Heights issue and Pakistan’s role in helping Syrian brethren? Syrian Golan is a region in the southwest of Syria; it has been occupied by Israelin June 1967.The U.N. has rejected this occupation and has adopted the Resolutions242 (1967) and 338 (1973) calling on Israel to withdrawfromthe occupied Golan. The international community has even rejected the Israeli annexation of the occupied Golan with the Security Council Resolution 497 (1981), which unanimously called this move, “null and void” and not one country has legitimized it. In 1973, Syria attempted to liberate its occupied Golan territory from the Israeli occupation in the October’s liberation war, known as “Ramadan War”. During this war, the real meaning of the historical ties between our two brother peopleshad been demonstrated by dispatching military training staffs to Syria, as well as many fighter pilots, whoflowSyrian Air fighter jets and participated in the war. We still remember in Syria the heroic performance of the Pakistani pilots who downed 3 Israeli jets, both of them had been decorated with the highest Syrian orders for their heroic achievements. In this context, we underline that Golan is Syrian and will return to Syria sooner or later. And with reference to the external interference, it’s worth to mention that Israelwhich is the biggest beneficiary of what is going on in Syria, is seeking by all means to prolong the war by supporting the terrorists, because Syria’s victory will change the map of the region and the world and Israel will be the biggest loser. 5-How would you describe bilateral relations between Pakistan and Syria giving us some historical background of these relations? In view of the historical ties and exchanges between the two people, establishedthrough the ancient centuries, especiallysince the Islamic conquests at the seventh and eighth centuries,Both countries have decided to establish diplomatic relations before the end of 1949, it means only two years after their independence in 1947. Bilateral relations have developed ever since, with some turbulence during President Zia-ul-Haq,who visited Syria in 1987 to put an end to the different between both brother countries. A long list of official visits were exchanged, led by Syrian presidents ShukriAlkuwatliin 1957, and Hafez Al-Assad to Lahore in 1974, and many visits of Pakistani Presidents, Zia-ul-Haq, PervisMusharaf, AssifZardari, and many visit of the late PMs, Zoulfikar Ali Buttho, and Benazir Buttho. 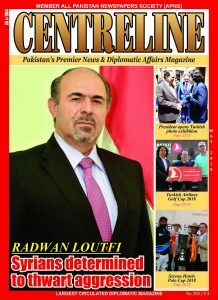 From the beginning of the crisis, in spite of pressures from many close allies; Pakistan has maintained the best level of bilateral relations, has adopted a clear position based on the principles of international law and UN charter,it has always rejected any interference in the Syrian internal affairs, called for protecting the sovereignty and territorial integrity of Syria and hoped that the issue of Syria will be resolved politically, as well as. 6-In which fields, do you think both Pakistan and Syria can cooperate with each other? Since 1960, both countries agreed on organizing thecommercial relations. A cultural agreement was signed in November 1971 thatorganizes the cooperation between both countries on the levels of culture and education.It is still valid till now.A mutual comity of the commercial, scientific and technical cooperation has been set up in 1989. 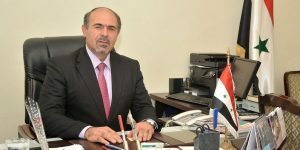 I think there is an utter need to exchange official visits in order to update those agreements, and to explore the new opportunities of mutual cooperation.Again there are plenty of commercial opportunities for business,so we urge our brothers Pakistani businessmen to visit Syria,explore the huge demands of the requirements of the reconstruction era. The Syrian embassy is ready to provide the Pakistani chambers with any necessary information about, including setting up contacts with the relevant Syrian chambers of commerce & industry. 7-Any message to Pakistani people? To the Pakistani officials we say thank you for your wise stands toward Syria, we are really grateful to all officials at all levels, who don’t spare any occasion where we meet, withoutconveying their love and respect to Syria government and people, expressing their empathy with the Syrian people, rising prayers to Allah swt.to end their grievance. Again, we should thank our brotherly Pakistani people, and we feel deeply touched with their hospitality and warmness. I would tell all of them, Syria is still there w alhamdulillah and Syria would welcome shortly all of them.